After the C5 Aircross reveal, Citroën is stepping up its international offensive in the SUV segment with the New C3 Aircross, its “new-generation” compact SUV with an assertive personality. Its unique body styling and its generous forms lend it a powerful and fresh attitude. A personality strengthened by extensive personalisation possibilities, with 90 exterior combinations and 5 interior design scheme choices. Inspired by customers exceptations, this “people-minded “ SUV features unrivalled spaciousness and modular design and is reaching outwards thanks to its opening panoramic glass sunroof. As ambassador of the “Citroën Advanced Comfort®” programme, the C3 Aircross brings total well-being on board and an extraordinary at-the-wheel experience. Equally at ease in the city and out on the open road, the new model’s adventurous abilities have been enhanced with the Grip Control® and Hill Assist Descent systems. It is also equipped with modern technologies including 12 driver assistance systems such as the head-up display and 4 connectivity technologies such as wireless charging for smartphone. The New Citroën C3 Aircross Compact SUV will be launched in Europe in second-half 2017 then rolled out internationally. Following the new C5 Aircross, the C-segment SUV revealed in April at the Shanghai Motor Show, Citroën is stepping up its international SUV offensive in 2017. Today the Brand is revealing the New Citroën C3 Aircross Compact SUV, poised to conquer a segment having grown five-fold in Europe and worldwide between 2012 and 2016. The Brand’s SUVs are people-minded and inspired by customers. Their design is informed by the motoring experience of customers and their desire for optimism and sharing. To the protective character of the exterior styling, these new generation SUVs add the appeal of a different and energetic personality, standing as a new benchmark on comfort, use and on-board living. They illustrate all the Brand’s expertise in design, cabin space and well-being. Inspired by the C-Aircross concept car presented at the Geneva Motor Show 2017 and featuring classic Citroën design cues, the New C3 Aircross brings a breath of fresh air to the compact SUV segment. Outside, it stands out with its unique body styling and unprecedented personalisation choices, giving it an assertive personality. Inside, it innovates through its comfort as part of the Citroën Advanced Comfort® programme for enhanced spaciousness, modular design and brightness. Firmly contemporary, the New C3 Aircross is eminently connected and equipped with a range of technologies that make life easier in the city and on the road. In short, Citroën’s new SUV invites fans of style, well-being and adventure to live a whole new experience. The New Citroën C3 Aircross is a compact 4.15-m long SUV distinguished by its powerful, original and fresh attitude. It boasts unique body styling fully representative of new Citroën models and all the attributes of a robust and protective SUV, including raised ground clearance, a high-set driving position, front and rear skid plates, large wheels and wing extenders. The body styling with its generous forms is underscored by strong graphic features such as touches of colour on the roof bars and “Venetian blind” rear quarterlights. The C3 Aircross offers a unique and unprecedented personalisation offer comprising 90 exterior combinations, including four roof colours for two-tone models and four Colour Packs, along with five highly distinctive interior design schemes. The cabin, with its horizontal design approach, clearly conveys spaciousness and protection. The C3 Aircross is also very much an SUV in terms of driving pleasure and handling. Nimble in the city owing to its compact body and ready for adventure with its Grip Control® and Hill Assist Descent systems, the C3 Aircross is available with a broad selection of frugal and efficient petrol and diesel engines. The Citroën Advanced Comfort® programme, focused on mental and physical well-being, informs the practical and generous personality of the new-generation compact SUV. Through its ingenious architecture, the New C3 Aircross is a compact SUV that makes everyday life easier with absolutely no compromises on comfort or functionality. The cabin is home to broad and comfortable seats and offers class-leading spaciousness (best ceiling height, generous leg room), unrivalled modularity (sliding bench in two independent parts, flat-folding front passenger seat for a load length of 2.40 m) and exceptional boot volume (410 litres and up to 520 litres). Travelling well-being is also conferred by a light-bathed cabin thanks to the large opening panoramic glass sunroof. Fully in step with its times, the C3 Aircross features ingenious storage spaces, including a wireless smartphone charging area on the central console. It is available with a complete range of driver assistance systems, such as head-up display, the Active Safety Brake function, automatic high-beam lights, speed sign recognition with recommendations, as well as useful technologies including Park Assist and Citroën Connect Nav. The New Citroën C3 Aircross is a compact SUV distinguished by its powerful, original and fresh attitude. The body styling is fully consistent with the Brand’s latest creations and possesses all the attributes of a robust and protective SUV. It also offers unrivalled personalisation possibilities. Its SUV nature and optimism are expressed in the Grip Control® and Hill Assist Descent systems, perfect for off-the-beaten-track adventure. The New Citroën C3 Aircross Compact SUV was created through the inspiration of the design teams headed by Alexandre Malval, Styling Director at Citroën. From the very first gaze, the C3 Aircross appeals with its unique body styling, freshness and protective appearance. Its compact and high-set dimensions (4.15 m long, 1.76 m wide and 1.64 m tall) are well proportioned and showcase the car’s flowing and dynamic design lines. 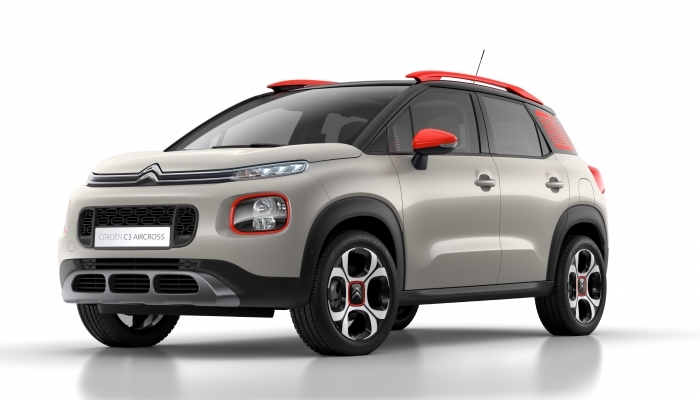 Citroën’s attractive compact SUV dominates the road. The design of the New C3 Aircross is unique to the segment with its muscular bonnet, both short and high-set. It conveys a sense of robustness and underscores the front and rear light signatures while remaining free of aggression through its horizontal balance and generous forms. Standing firm on its large-diameter wheels, the C3 Aircross has a ground clearance some 20 mm higher than the New C3, whose platform it shares. The new model’s wing extenders and protective skid plates also contribute to the dynamic and protective SUV styling. These visual features reinforce the car’s adventuresome aspect and express its singular personality. At the front, the New C3 Aircross sports Citroën’s classic graphic signature with two-tier lights. The headlamps strengthen the expression of the front end and confirm kinship with the Brand’s latest models. The upper part consists of LED daytime running lights connected to the chevrons via a double chrome strip, serving to express the entire width of the car. The lower part is home to the main light unit. Comprising square-yet-rounded lamps enlivened by a colour surround, this area also houses the fog lamps. A large air intake in the centre strikes a powerful note. At the lower part of the front end, a protective skid plate underscores the whole and confirms the SUV nature of the C3 Aircross. At the rear, the powerful shoulders of the C3 Aircross emphasise its width and muscular character. The 3D-effect rear lights spell out the family connection with the new C3 and the C-Aircross concept car. The sophisticated light units are complemented by Gloss Black inserts in the tailgate featuring the two-tone C3 Aircross badge and Gloss Black chevrons. This bold combination broadens the two light units and underlines the sense of width while firmly denoting the car’s high-tech nature. The imposing rear bumper topped by a protective skid plate echoes the front end and once again affirms the car’s robustness and SUV spirit. A true SUV, the New C3 Aircross features wing extenders on the wheel arches and body-tinted sill panels. The car’s profile thoroughly conveys its SUV personality. The sides of the new model are characterised by horizontal balance and a promise of interior volume and marked by innovative components such as the stylish quarterlights, constituting a unique signature. Previewed by the C-Aircross concept car, the rear quarterlights, made out of polycarbonate and layered with a coloured film, create a strong graphic contrast on the C pillar. With their “Venetian blind” effect, they add a unique character trait and also serve to conceal the inside of the car, but without keeping the light out or reducing visibility. Another distinctive feature of the design and personality of the New Citroën C3 Aircross is the way it can be adapted to match the personality of customers. As with the new C3, Citroën designers have given the New C3 Aircross a bold and modern spirit that is highly customisable. Each person can express their personality, from the most conventional to the most contrasted. Customers can choose the colour of their roof and combine it with a Colour Pack for the body. Energising the styling of the compact SUV, these touches of colour were designed down to the very last detail, applying to the roof bars, rear quarterlights, door mirror housings, front headlamp surrounds and wheel centre trims. 4 Colour Packs (Orange, Grey, White, Black). Depending on their taste, customers can enhance classic tones or soften contrasting hues. They also get to choose between several wheel designs with a collection of stylish 16-inch wheel trims and 16-inch or 17-inch diamond-effect aluminium wheels. The Hype Mistral design scheme conveys a high-end feel. It comprises a black leather and dogtooth pattern cloth combination and a TEP-covered dashboard. The air vents feature satin chrome surrounds. The C3 Aircross is also very much an SUV in terms of driving pleasure and handling. Dominating the road with its raised ground clearance and large wheels, the New Citroën C3 Aircross is at ease on all terrains thanks to the Grip Control® and Hill Assist Descent systems. Able to venture out of the city and leave the beaten track by adjusting grip, the C3 Aircross is ideal both for fans of urban adventure and shopping excursions and fans of sports, leisure and outdoor activities. Equipped with the Grip Control® system for improved traction and special 16-inch and 17-inch mud-and-snow tyres, the C3 Aircross offers a highly modular drive and adapts to all types of roads, whatever the conditions and surface. Safety is enhanced in all circumstances through five driving modes. Drivers can leave the Grip Control system on automatic via Standard mode or select between Sand, All-Road, Snow or ESP OFF modes. Combined with Grip Control®, the Hill Assist Descent function maintains the car at a reduced speed even on steep inclines. This technology keeps the C3 Aircross on the right trajectory while limiting the risk of slippage as the car descends slopes. The new function helps drivers to keep perfect control over the C3 Aircross in complete safety. The system can keep the vehicle at a very low speed (3km/h) for added control and safety in what can otherwise be stressful driving situations. The technology and adventurous nature of the new model are underlined by a broad range of frugal and efficient latest-generation engines. An ideal life partner for day-to-day urban drives or week-end getaways and travels to far-flung destinations, the C3 Aircross is available with PureTech 3-cylinder engines equipped with the latest technologies for heightened responsiveness and controlled fuel consumption and emissions. (The PureTech engine won the “International Engine of the Year” award in 2015 and 2016.) The BlueHDi engines also bring occupants driving pleasure, economy and environmental respect. Petrol: The New Citroën C3 Aircross Compact SUV is available in its highest-performance version with the PureTech 130 with a 6-speed manual gearbox. The PureTech 110 engine is available with a manual gearbox (PureTech 110), as well as an EAT6 automatic gearbox for maximum driving pleasure and comfort (PureTech 110 EAT6). The entry-level model is powered by the PureTech engine with a manual gearbox (PureTech 82). Diesel: The New Citroën C3 Aircross Compact SUV is available with a manual gearbox with a choice of the BlueHDi120 6-speed manual gearbox, BlueHDi 100 manual. These six engines, all available in Europe, are rounded out by two special engines for international export: PureTech 110 EAT6 petrol and HDi 90 diesel. Present at each design stage, the Citroën Advanced Comfort® programme underlines the meticulous attention paid to the well-being of body and mind and underscores the practical and generous character of this people-minded compact SUV. Designed as a true space for living, the C3 Aircross is warm and convivial. With its ingenious architecture, it combines compact design outside with outstanding roominess inside. An easy car to live with day in and day out, the New C3 Aircross scores high on user friendliness through its intuitive technologies. The New C3 Aircross is fully focused on travelling comfort, in which the perception of space and the sense of well-being play a key role. These sensations, felt instantly on entering the vehicle, are created by the horizontal design of the dashboard, freeing up space, and by the welcoming and comfortable seats. Spacious and extensively modular, the New Citroën C3 Aircross Compact SUV delivers a unique proposal in the segment with a singular interior home to class-leading spaciousness. Informed by the Citroën Advanced Comfort® programme, the C3 Aircross innovates through its design, providing exceptional cabin space, modularity and boot volume. Spaciousness: The high-set architecture of the C3 Aircross brings it the most spacious interior in the segment and outstanding comfort, with five seats and generous leg and head room. The C3 Aircross is the segment leader in terms of front and rear head room with the best ceiling height. Each passenger is fully at ease in the front and rear alike. Rear knee room is also remarkable, thanks to a wheelbase of 2.60 m.
Modular design: The C3 Aircross has the most advanced modular design in its category with a 60/40 split-folding rear bench with folding seat backs and seats in two independent parts sliding through 150 mm. These adjustments are extremely simple. The ultra-modular front passenger seat can be folded down to transport long objects. In a single movement, maximum load length can be extended to 2.40 m.
Boot volume: limits on passenger luggage are a thing of the past since the C3 Aircross has the largest boot in the segment, access to which is facilitated by a broad rear window, large-opening tailgate and low loading sill. The boot’s standard volume of 410 litres can be increased to 520 litres with the rear bench folded down (in forward most position). Total load volume with the rear seats folded down is an impressive 1,289 litres. Strong on everyday practicality, the C3 Aircross also features a removable luggage shelf that can be stored in vertical position behind the rear bench for transporting tall objects. In a further ingenious touch, the dual-height mobile boot floor provides a flat floor with the rear seatbacks folded down. A source of well-being and freshness, the New C3 Aircross places a premium on conviviality and cabin light. The new model features an extensive glazed surface area bringing motorists 360° visibility and impressive luminosity. This sensation is enhanced by the relaxing effect of the rear quarterlights with their “Venetian blind” print creating an original play of light and shadow. The C3 Aircross also offers occupants a vast view of the sky with its opening and fully panoramic glass sunroof. Unique to the B SUV segment, this equipment, complete with a sequential electric control, is generously sized (interior glazed area of nearly 1 m long) and features a sun blind and an LED light guide. Cabin light can also be adjusted using the sun blinds in the rear seats. With the roof open or closed, the C3 Aircross brings passengers an exceptional feeling of freedom and makes each and every journey unique. Another essential component in travelling comfort is storage space. The eminently functional C3 Aircross benefits from a range of storage compartments. Ingenious and use-specific, they respond to a broad range of needs. The central console was designed to store a smartphone with a special dock and wireless charging. The lighted and cooled glove box has room enough for a 1.5-litre bottle, as do the front passenger and driver door bins. The “penholder” space on the passenger side of the dashboard can accommodate slim objects such as keys, pens and coins. Back-seat passengers benefit from extra storage spaces. The central folding backrest includes cupholders and also features a ski-flap function for transporting long objects. – sound comfort, with meticulous soundproofing and acoustics. Keyless entry and start: a hands-free access and start system that allows the driver to open and start the vehicle without getting the key out. Colour head-up display: bringing the driver useful driving information in his or her line of sight. Projected in colour on a retracting blade, the data (on speed and cruise control/speed limiter settings, etc.) are accessible continuously, without drivers having to take their eyes off the road. Park Assist: making parking manoeuvres more relaxing, easier and safer. Park Assist is an active parking assistance system, for parallel and perpendicular parking. When prompted by the driver, it automatically detects a space then controls the steering for an entirely safe park. All the driver has to do is shift into reverse, accelerate and brake. Active Safety Brake: with a sound and visual alert to reduce the risk of frontal impact by braking in the place of the driver. The multi-function camera on the upper part of the windscreen detects obstacles, such as vehicles driving in the same direction or at a halt. From 5 km/h to 85 km/h, the sensor works on the brakes automatically if a risk of collision is detected. The speed of the vehicle must not exceed 80 km/h when an immobile vehicle is detected and 60 km/h for a pedestrian. Lane Departure Warning System: to fight against drowsiness at the wheel or a simple moment of inattention at over 60 km/h. The system detects any accidental crossing of road markings (continuous or dotted) with the indicator not activated, and warns the driver with a sound signal and message on the instrument cluster. Blind Spot Monitoring System: to alert the driver of the presence of a vehicle in their blind spots via an icon in the door mirrors. Speed limit recognition system and recommendation: drivers are informed of this information via the instrument cluster and the system records the speed indicated as a setting for the cruise control/speed limiter system. Intelligent beam headlights: for safer driving at night, this system automatically switches between high beams and low beams depending on the lighting and traffic conditions. Driver Assistance Alert: to monitor driver behaviour via the multi-function camera on the upper part of the windscreen and alert drivers of any drop in vigilance. This system assesses the driver’s attention level by identifying differences in trajectory relative to the road markings. It is particularly adapted to expressways at speeds of over 65 km/h. Coffee Break Alert: drivers are alerted when it is time to take a break after driving for two hours at speeds of over 70 km/h. Grip Control® with Hill Assist Descent: for a highly modular driving adapted to all types of roads and reduced speed even on steep inclines. Wireless charging for Smartphone, with a special docking area. This all-new system can be used to induction charge a wide range of smartphones or devices compatible with the Qi standard with a charging mat built into a dedicated storage space in the central console. It also disposes with physically and aesthetically cumbersome cables. Wireless electric energy transmission is based on the principle of magnetic induction. Mirror Screen function, with Android Auto, Apple CarPlay™ and MirrorLink®. Drivers enjoy the multimedia content and apps of their smartphones in complete safety by replicating and controlling them via the 7-inch touchscreen. CITROËN Connect Nav, connected 3D navigation with voice recognition. This new-generation navigation system comes with connected services such as TomTom Traffic, for real-time traffic info, service-station and car-park localisation and prices, weather information, and a local point-of-interest search function. Users will also appreciate the “Dangerous Areas” function. CITROËN Connect Box, Emergency & Assistance system. This service (or emergency call) puts drivers in contact with a specialised assistance platform in the event of breakdowns or accidents. Agile in the city but also equipped with resolutely all-road attributes for daily adventures, the New Citroën C3 Aircross Compact SUV meets the requirements of modern lifestyles. The people-minded SUV is customisable, focused on motorists and their new motoring behaviour, and provides them with unprecedented character, comfort and spaciousness. Produced at the Zaragoza plant in Spain, the new-generation compact SUV will be launched in Europe starting in second-half 2017 (depending on the market). Prices will be announced in July.